The fear of Witches and Witchcraft has been part of European culture for centuries, it was endemic throughout society in 17th century England and no where more so than in small, rural communities where witchcraft was commonly blamed for almost any form of misfortune. From sickness or death of both humans and animals, to crop failure and storms, indeed, almost any and every unfortunate circumstance was generally attributed to bewitchment. This naturally created the desire for individuals to seek protection against these dark and terrifying supernatural forces. One such counter-measure was the procurement of a ‘witch bottle’, as mentioned in Joseph Blagrave’s ‘Astrological Practice of Physick’, published in 1671. This involved the appropriation of a bottle, (commonly of the distinctive salt glazed stoneware variety known as ‘Bellarmine’ or ‘Bartmann’ bottles, although these were not exclusively used) and depositing inside a combination of symbolic and biological matter relating to and deriving from the victim or fearful, such as bent nails and pins, heart shaped pieces of fabric, human hair, urine and nail clippings. 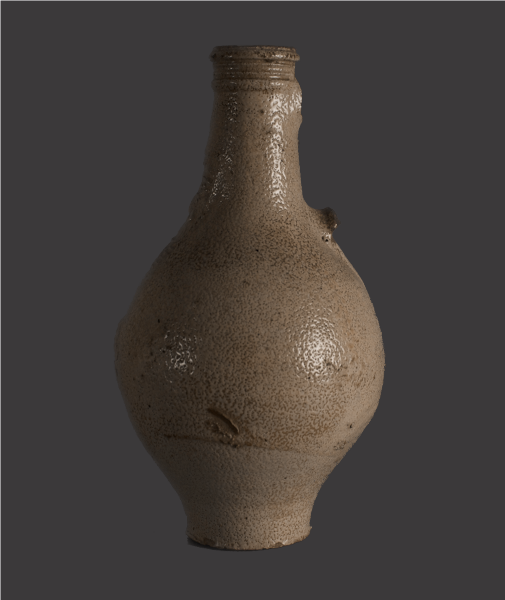 The bottle with its various ingredients would then be sealed and subsequently buried, usually under the threshold or hearth of the owners dwelling. This ritual was regarded as being a particularly reliable antidote or insurance against evil spells, reversing the effects and returning it to the witch. 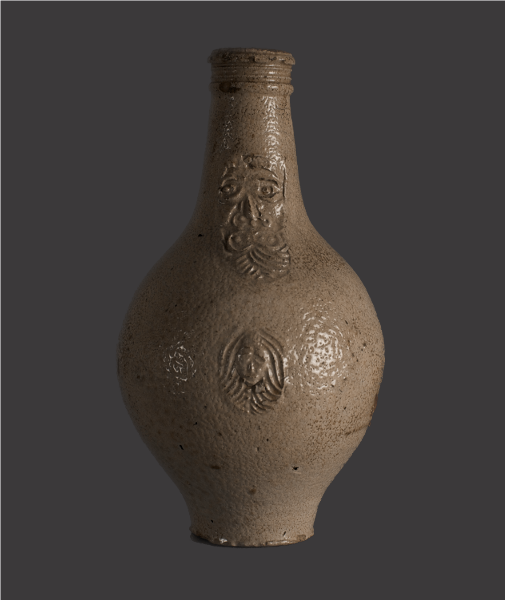 This superb Bellarmine, ‘Witch bottle’, is particularly noteworthy, being of unusual and untypical colour with a very rare face medallion. It was discovered during building work at Aldringham in Suffolk in the early 1930’s by the celebrated and talented local architect, artist and poet, Cecil Lay,(1885-1956), beneath the hearth of an ancient cottage which he enlarged shortly after his marriage in 1932 to the artist and book illustrator, Joan Chadburn, (daughter of the artist Haworthe Chadburn), as the marital home. 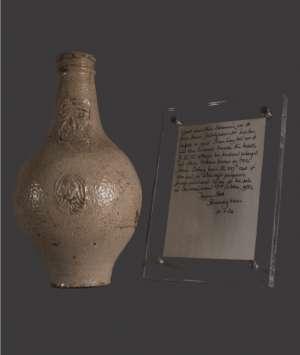 The bottle remained in the ‘Lays collection’ throughout their lives. It was acquired in 1986 by the well known Norfolk antiquarian and collector, Bryan Hall,(1922-2004), of the ‘Old Rectory’, Banningham. A handwritten note, (now held in a perspex frame for conservation), accompanies the bottle, written by Bryan Hall, recalling the first time he saw it in 1965 and recording the details of its discovery. This ‘Witch Bottle’ is mentioned in the Sally Kevill-Davies article for ‘Antique Collecting’, June 2004. An original copy of the magazine will be included with the bottle.